Well this book was a real surprise for me, but also for my book club! I didn’t originally vote for it but it passed the cut for the list of books to read for my book club 2011-2012. Everybody enjoyed the story and said they learned so many things. Reading the synopsis frightened me. I thought, “Oh God not another World War II book and on top of that about the Pacific and Japan.” I was cringing and trying to avoid it because I was dreading the pages about his captivity(about 150 pages), but happily I was wrong and strong. It was that but so much more than that. This was a fantastic read about a true American hero that I hadn’t heard of, Lieutenant Louie Zamperini. This biography follows Zamperini’s life from the beginning, turbulent and headstrong, all the way through becoming a bombardier in the Air Corps in world War II, to his capture and internment in POW camps in Japan, and life after the war. He is an extraordinary person who survived many excruciating trials when most people would have given up. Just as it’s written in the title: “It’s a story of survivall, resilience, and redemption.” It’s obvious that his incredible strong will and confidence helped him pull through it all. Unbroken is a 406 page book but what a page turner, along with a bit of suspense toward the end! I learned so many different things about the war, the Olympics, B-24s, etc. I must admit thinking back to high school I realized that the Pacific hadn’t been covered in the same depth as the Normandy invasion. I knew very little about it. So, for all of you out there like me, you should read this book. Hillenbrand’s style of writing is smooth, informative but most of all easy to appreciate. Moreover, everything is so well described that your imagination comes alive while reading. Certain descriptions of the bomber planes and flying incidents are very clearly explained. 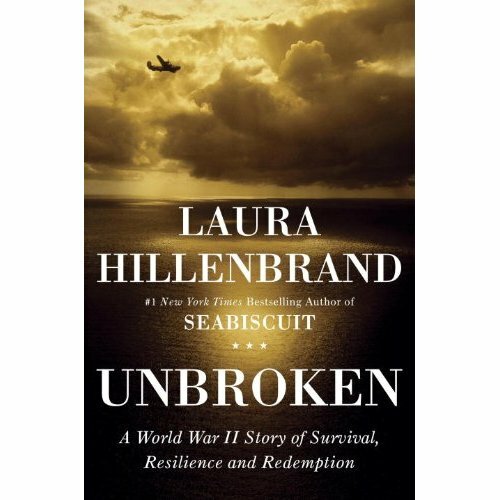 Laura Hillenbrand is known for having written another extraordinary true story called Seabiscuit which is about a race horse. It’s amazing to see how much thorough information she acquired from Louie Zamperini and his family members, not to mention the help from people who corrected her writing of the flying scenes so that they would be more true to life. Some people have criticized Hillenbrand’s style saying that it was written like a movie script, which I find harsh. Personally I don’t have a problem with that. I think it made it more readable and very intriguing. The only real mistakes I thought she made was when she occasionally let her personal opinion creep in on a situation where it wasn’t necessary or when she goes on about thee feelings of certain people when she couldn’t know exactly what they would have thought and felt. Nevertheless, once you get started you will plunge into the story and won’t be able to put it down. I read this book in 3 days and started to wonder about the audiobook of Unbroken. I imagined it would be very captivating to listen to because of the storyline. So I checked it out on You Tube and found an extract. Click below. I give this book 4 and a half stars and am so glad I read it. Thanks Sonia for suggesting it and sorry I teased you so much about it. We missed you at the meeting. Check it out everybody!